The planned “traveler’s rest” is to include 120 gas pumps (yes, 120), copious car parking (trucks and 18-wheelers are NOT allowed) and a +- 52,000 SF store (same size as the Publix at IGP/SR 16/Pacetti Road). The +- 13.7 acre site is located at the southwest corner of the I-95 interchange, off of World Commerce Parkway at Prosperity Court. One thing is for sure – should the proposal successfully manuver the County review gauntlet and actually get built – the Interchange will be newly landmarked by their presence, visibility, operations and repeat customers. I believe some of their approval hurdles could include review and approval of such items as signage, site design, landscape embellishments, ingress/egress provisions and possibly a requirement for I-95 Exit #323/IGP ramp and/or intersection improvements. True, the scale of the facility along with its operational dynamics are more conducive and enticing to the regional traveler. If that remains the case, the existing gas, convenience and food stores could be relieved of Interstate-induced demands so that they can cater directly to the community and neighborhood populace. Additionally, passing customers drawn to the area by the lure-of-the-beaver may be inclined to patronize other businesses and become familiar with the attributes and assets of our area. Remember – “good growth is good”. Growth that is fueled by successful, experienced, well-financed owners/operators usually spells “good growth”. Purpose-driven growth can be mutually-beneficial. Speculative growth can be a hollow-burden that saps surrounding values. When the NIMBY-challenge barks (Not-In-My-Back-Yard), I think it best to be directed at the later, not the former. The jury is still out. The County is just now commencing reviews. Zoning and land-use regulations are far different and more stringent here in Florida and St. Johns County than just about anywhere in Texas. Time will tell. Signs will promise. 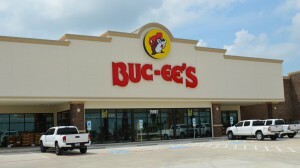 Buc-ee’s establishes branded billboard advertising campaigns in proximity to their stores. If all goes well for them, pretty soon you will see their Interstate messaging which includes such gems as; “Don’t Pass Our Gas”, “Clean Restrooms, We Guaranpee It”, “Don’t Worry, P Happy”, “Ice, Beer, Jerky : The 3 Food Groups”. In the meantime, they will be hoping that the County and the Region will agree with one of their other favorite messages; “Worth The Wait”. Buc-ees are great. I’m all in. Can’t wait for their doors to open! Anyone who’s been to a Buc-ee knows what I mean. I would like to be assured that all of the future employment will be full time at 40 hours with benefits. St. John’s county needs good employment opportunities within the county and not more partbtime at minimum wage. I buy my gas at Gate and both my wife and I know how to cook. Who needs them? I don’t. People passing through…never seen all the pumps at Gate in use plus what else will they attract. No 18 wheelers…right!!! I have recently read your November wgv blog, and while I understand your desire to be neutral, it comes across as pro-bucees. others have gotten the same impression. this is not good growth. world commerce center was envisioned as a job hub to provide a living wage and to stem the exodus of workers driving daily into jax/duval. bucees will NOT provide a living wage. it will provide mostly part-time, supplemental jobs. and, it is NOT consistent with the world commerce PUD. and traffic? we already have one of the most dangerous exits/entrances. and to add 20,000 to 25,000 more cars? and bucees wants our taxes to help pay for any road improvements? how does this benefit the world golf village area? we cannot even get parks built around here. you wrote that the existing gas stations will be ok, catering to us locals. were the (then) existing stores ok when the old publix closed? NIMBY????? mr. pariani, I know you fought long and hard to redevelop the sawgrass shopping village, and great job. but, would you have welcomed bucees there? you do not live here. ”DON’T PASS OUR (SAW)GAS ??? ?